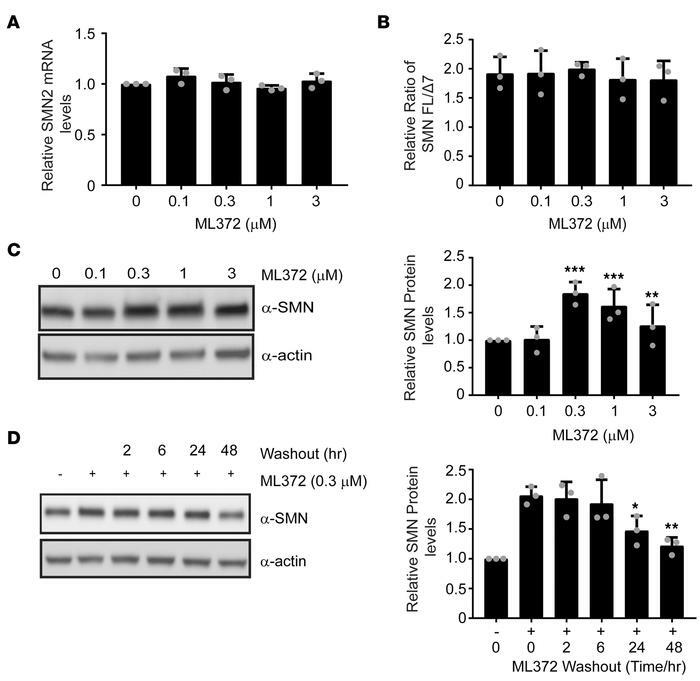 ML372 enhances SMN protein level and function. Spinal muscular atrophy patient fibroblast 3813 cells were treated with vehicle or ML372 at indicated concentrations for 48 hours. (A) SMN2 transcript expression was measured by qPCR. (B) The relative ratio of full-length SMN to the Δ7 mutant (FL/Δ7) was used to determine the exon 7 inclusion in SMN2 mRNA. (C) Western blot was used to determined SMN protein levels (left panel). Densitometry analysis is shown as the mean ± SEM (n = 3, **P < 0.01, ***P < 0.001) (right panel). (D) A series of wash-out experiments were performed and SMN protein level was determined by Western blot. Densitometry analysis is shown as the mean ± SEM (n = 3, *P < 0.05, **P < 0.01) (right panel). All P values determined by unpaired 2-tailed Student’s t test.